Welcome to United Martial Arts Family Center! UMAFC is a group of Martial Artists dedicated to delivering best value teaching based on innovative applications of our understanding of the Taekwondo and Hapkido. Located in southern San Diego, we strive to be the leading Martial Arts school organization, empowering our students and their families through the principles of Martial Arts. Martial Arts improves your most basic learning tool – ATTENTION SPAN! We all need to improve our power of concentration. Children need it to focus in school. Adults need it for work. 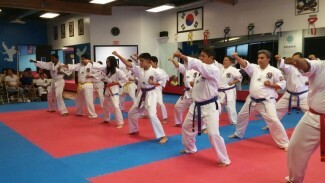 We’ll show you how Taekwondo & Hapkido builds a stronger mind, body, & spirit! A fun way for the whole family to develop self-control, boosted confidence, and effective self-defense! Young, old, male, or female – all experience levels welcomed! We’ve got over 50 years of combined experience under our Black Belts. You’re in good hands – and feet! Try a week of classes – Free! Check our Schedule for times! Hands down the best Tae Kwon Do school in South County! All of the instructors do their best to bring out the best in their students! The Masters at this school are amazing with the kids. This is the second Tae Kwon Do school for our son and we are sooooo happy we made the switch.